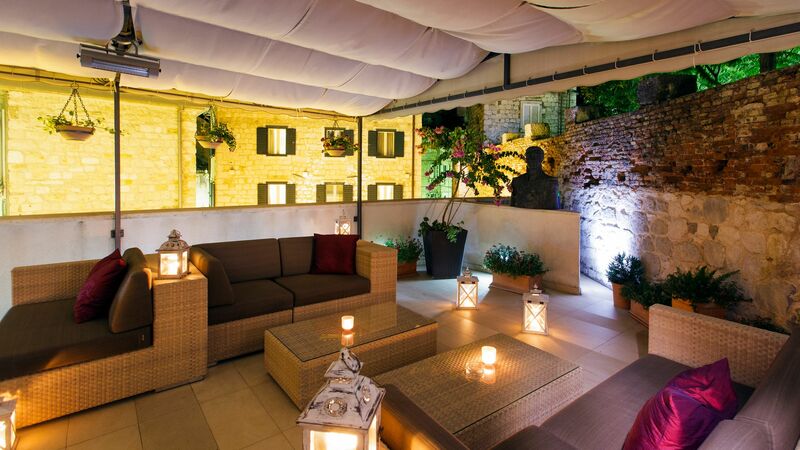 Marmont Heritage Hotel offers guests a fantastic location within the winding streets of Split. It’s close to bars, restaurants and boutiques, as well as being just a six minute walk from the beach. This beautiful hotel has a sense of history and Croatian culture, which can be found in its 15th Century building, as well as modern amenities and elegant décor throughout each of the rooms. Relax in this boutique hotel, knowing everything is taken care of, with personalised service available 24 hours per day. 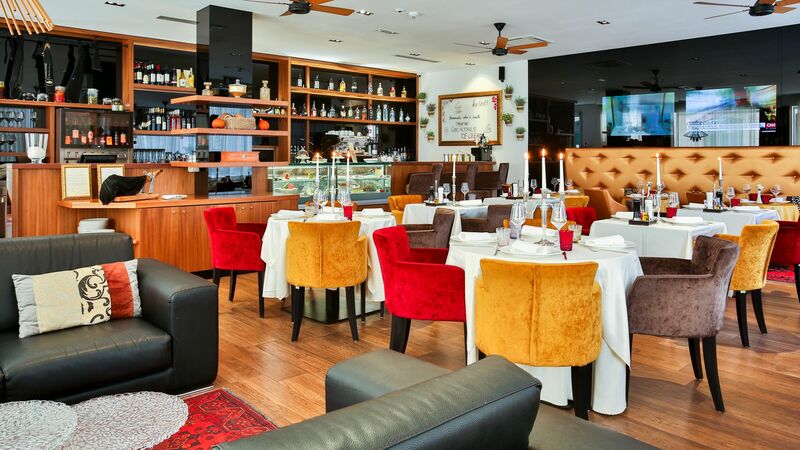 The restaurant serves up a delicious selection of cuisines, with both Croatian and international options on the menu. Enjoy an extensive buffet spread for breakfast, succulent meats and fresh local seafood for lunch and dinner or a traditional afternoon tea. The lounge bar and terrace are ideal for those wanting to unwind with a drink at the end of the day. Choose from a spectacular buffet at breakfast, succulent meats and seafood paired with local produce for lunch and dinner or even a traditional afternoon tea. Inside you’ll find rustic details and the original 15th Century walls, as well as an extensive bar serving fine wines, cocktails, champagnes and more. Unwind in the hotel’s lounge bar with a drink after a day of exploring. 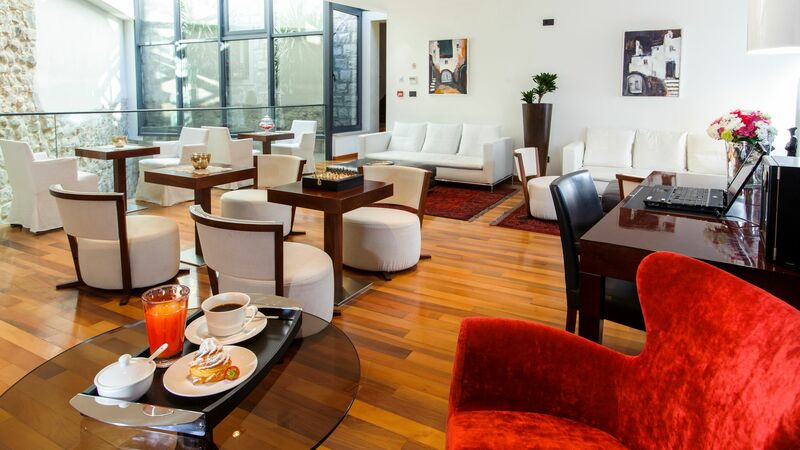 Daily newspapers are provided, and drinks include tea and coffee, smoothies, spirits, wines and champagnes. Watch the sun set across the bell tower of St Duje Cathedral and the rooftops of Split’s old town from the relaxing hotel terrace. Choose from teas, coffees, wine, champagne and cocktails. The Marmont Heritage Hotel is located just minutes from the centre of Split, in its historic old town. Found along the narrow winding streets, it’s ideal for those wanting to explore the bars, restaurants, cathedrals and UNESCO World Heritage Sites the town is so well known for. Alternatively, for a relaxing day spent soaking up Croatia’s almost year round sunshine, the beach is just a six minute walk away. Those wanting to explore the area further will find some fantastic islands located just off the coast, including Hvar with its pretty streets and luxury hotels. Alternatively, head to Brač for excellent shopping or one of the smaller islands for secluded sands and uninhabited interiors. Marmont Heritage Hotel is a 40 minute drive from Split Airport. Enjoy the modern amenities which blend with the historic features of these spacious rooms. Inside, you’ll find a large double bed, a work desk, seating area, satellite TV and air conditioning for your comfort. The en suite bathroom contains a hairdryer, complimentary toiletries and a bath or shower. These bright and spacious rooms are decorated in elegant style to enhance the historic features of the building. Each comes with a large window overlooking the streets of Split’s old town, as well as a work desk, seating area, satellite TV and air conditioning. There is also a mini bar and an en suite bathroom with a hairdryer, complimentary toiletries and a bath or shower. Relax and unwind in these spacious and elegant rooms as you enjoy the historic features and chic décor. The large window overlooks the pretty street of Split’s old town and there is also a work desk, seating area, satellite TV and air conditioning. Guests can also enjoy a mini bar, tea and coffee maker and a gift on arrival. The en suite bathroom comes with a hairdryer, complimentary toiletries and a bath or shower. This luxury suite is large and spacious, with chic, minimalist details and amenities such as a home theatre and relaxation area. Guests can also enjoy free transfers to the city centre by golf buggy, a mini bar, air conditioning and tea and coffee maker. The large en suite bathroom has a separate massage bath and shower, complimentary toiletries and a hairdryer. The location is great but the service is very poor. There are steep stairs and no lift. If you are not youg & healthy, do not even try to come! No information. Very clean. I do not recommend if you have big luggages. We really liked our stay at this hotel. Our room was not large, but very comfortable. We loved the lounge area outside on the 3rd floor (I think it was the 3rd floor). The hotel is in an excellent location, near everything. We flew into Split and I would recommend contacting the hotel to send a driver to pick you up at the airport. This makes it very easy. Once we got to the old town, the driver had someone meet us in the hotel golf cart to take us and our luggage the rest of the way to the hotel. Otherwise, I think the hotel could be difficult to find. During our stay we could walk everywhere. Such a beautiful city and this hotel is very convenient to all the sights. Very helpful staff too. This is a wonderful hotel just a short walk from Diocletian?? ?s Palace and the old town area. The hotel itself is on a walking only zone and so one must park a block or so away. We reserved the parking spot (purely optional) and they met us at the spot and assisted in getting our luggage to the hotel. The hotel was located near shops and restaurants and the front desk was very helpful in making dining suggestions. it's hard to find this hotel, because the streets in Split are like a maze; but we found it, and it's a great little hotel in the heart of Split. parking is extremely tricky, so, contact the hotel beforehand to make sure you know exactly where to go to park, because no matter where, you still have to take your luggages and walk to the hotel. we got lucky and found a meter spot before we had to call the hotel for help. great room, excellent location, great service, small but nice breakfast buffet. definitely recommend. We stayed here for 2 nights while visiting Split. It was in a great location close to water front, shops and restaurants. Was picked up by golf cart and also taken to ferry by cart when we departed. Nice clean rooms and a modern hotel. Breakfast was average at best, but was included so that is a nice feature. Although located in a busy area, noise was not an issue. Staff was friendly and helpful. Overall was delighted by this great hotel in Split.